And here’s what Web 2.0 looks like if you’re not one of the world’s largest, most recognized names in corporate consultancy. 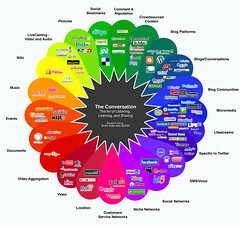 See what Brian Solis has to say about his conversation prism. Many of the nation’s youth and a few of their elders are expecting a magical turnaround of America’s economic fortunes as soon as their candidate for President, Barack Obama, is sworn in on January 20th 2009. But the Millennial Generation, born between 1982 and 2003, may be more the source of the country’s economic salvation as any initiative the new President might propose. Can Millennials Turn around the Housing Bust? | Newgeography.com	.